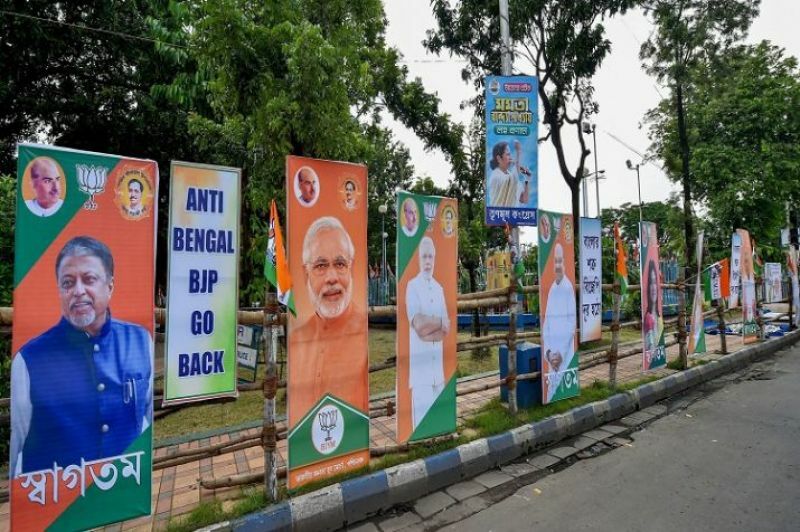 Kolkata: A day before BJP president Amit Shah’s visit to Kolkata, posters asking “BJP to leave Bengal” were seen put up in and around his rally venue at Mayo Road, in the central part of the city where he is scheduled to address 200,000 party workers. 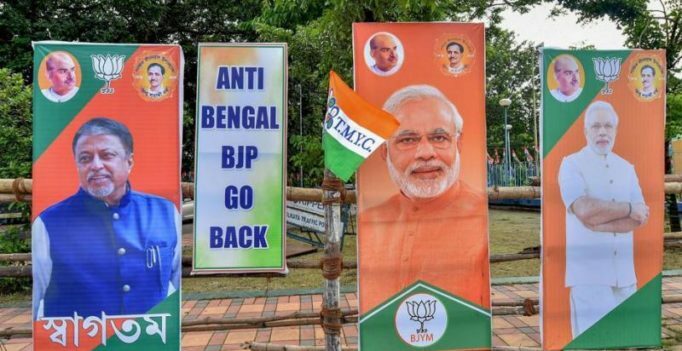 West Bengal wing of the BJP alleged that the placards with messages – “BJP, leave Bengal” and “anti-Bengal BJP go back” – were put up by the ruling Trinamool Congress led by Mamata Banerjee. “This shows that the TMC is afraid of our rally tomorrow. The days of TMC are numbered in Bengal. The people of the state are waiting for good governance of the BJP,” West Bengal BJP president Dilip Ghosh said. Bengal is not TMC’s “personal property”, the party has no right to make such demands, said another senior BJP leader. “The people of the state will decide in the coming days who will stay and who will leave,” he added. Trinamool Congress denied the allegation. TMC secretary-general and Bengal education minister Partha Chatterjee said his party had nothing to do with the “anti-BJP posters”. Meanwhile, the Trinamool Congress has called for a statewide protest against the National Register of Citizens (NRC) exercise in Assam on Saturday morning to which BJP said was the attempt of the ruling party in the state to sabotage Amit Shah’s rally. In letters sent to the state administration and the home ministry in Delhi, the state BJP has said the timing of the road blockades to be set up by the Trinamool Congress were aimed at interfering and interrupting the BJP’s supporters from entering Kolkata to participate in Amit Shah’s rally. If Trinamool protesters stop BJP rallyists from reaching the Amit Shah venue – and they are sure to, the state BJP chief Dilip Ghosh has said, then there will be clashes and the Trinamool will be to blame. The route that Amit Shah would take to reach the venue of his rally on Saturday, however, was seen dotted with cutouts of TMC supremo and West Bengal Chief Minister Mamata Banerjee. BJP national general secretary Kailash Vijayvargiya said the TMC had put up similar posters during Shah’s visit to Purulia in June and Prime Minister Narendra Modi’s rally in West Midnapore last month. The prime minister had even mocked by the TMC by saying that the ruling party in the state had put up the posters to welcome him, he said. “They have done this (display of TMC hoardings) in the past too. May be it is their way of welcoming people to the state,” Vijayvargiya said. TMC’s Partha Chatterjee, on his part, said there was nothing wrong in putting up posters and placards of their party supremo. “The TMC is the ruling party in the state and we have every right to put up posters and placards. We don’t need to take permission for that,” he said. Amit Shah’s Kolkata visit has been contentious soon after it was announced as the BJP claimed Kolkata Police was not giving it permission to hold the meeting. BJP’s master strategist Amit Shah’s visit to Kolkata is part of his effort to rapidly expand the party’s base that sends 42 lawmakers to Lok Sabha. 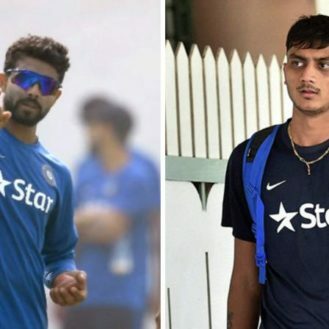 In 2014, BJP had won just 2 seats in the state and the party is hoping to improve its tally in 2019. For whom the bell swirls!